Senate Bill 444 passed unanimously out of the Kansas Senate Assessment and Taxation Committee last night. 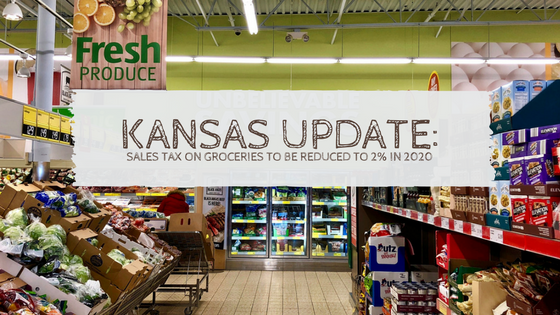 The bill would lower the state’s 6.5% sales tax rate on food to 4% in 2020 and down to 2% in 2021. KC Healthy Kids’ Ashley Jones-Wisner has worked with statewide partners and legislators over the last several years to draft and pass legislation that would lower the state sales tax rate on food. “It’s a huge success. The measure committee members approved will benefit the Kansas economy while putting dollars back into the pockets of Kansas families who need it most,” Jones Wisner said. “Legislators from both sides of the aisle have been continually coming together in support of lowering the state sales tax rate on food, and last night their work paid off,” she added. Senate Assessment and Taxation Chairwoman Senator Caryn Tyson showed great leadership on this issue and ensured the bill was passed favorably out of her committee. In reports published by KC Healthy Kids, Wichita State University researchers said the tax hurts low-income families and rural grocery stores and drives shoppers across state lines to buy groceries. This is great news, and progress. I’m still surprised that there was a sales tax on groceries at all in the first place. Previous Post CNNPolitics’ ways to get politically active – what will you do?